Strider Sports was established almost a decade ago, and has now grown to be a market leading company built on the back of the Strider balance bike. 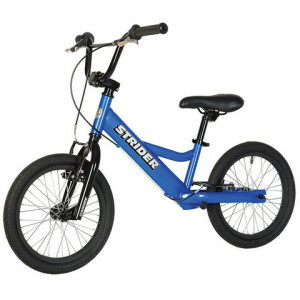 Strider bikes are known to be innovative, sporty and great fun to ride, and with models ranging from bikes for 2 year olds through to adult balance bikes there is a great range to choose from. This guide will look at the range of Strider balance bikes in detail so that you can find the best model for you. 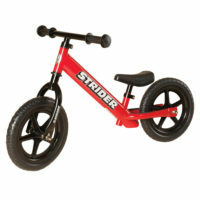 The ‘lead in’ Strider balance bike is the Strider 12” classic balance bike. This is one of our very favourite balance bikes, as it is packed with a huge range of features and offers a saddle that can be adjusted from 28 - 41cm. This means the bike is suitable for children of all age ranges from 18 months right through to 5 years - and can grow with your child as they learn to ride. Please note that an optional additional seatpost is required to make the seat height large enough for 4-5 year olds. The seat is one of the lowest on the market, which means that the youngest of children will be comfortable with their Strider balance bike almost as soon as they can walk. The saddle height is one of the most important features to consider when you are researching balance bikes, and you can check out some of our other recommendations for balance bikes for 2 year olds here. This Strider balance bike is one of the lightest and most adjustable balance bikes available at just 3.0kg, (the Puky LRM balance bike is 3.5kg in comparison) with a new design that includes a smaller moulded seat and ultra light wheels. All Strider bikes feature puncture proof, Eva polymer tyres and the main benefit of these wheels is that your child can ride on rough terrain without having to worry about getting a flat. Ideal for those afternoon rides in the woods! Other features include improved cartridge wheel bearings, an adjustable handlebar height between 46cm and 55cm, and a frame integrated footrest. 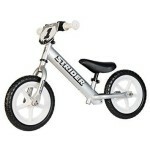 This is a particular feature of a Strider balance bike and can help older children to develop advanced riding skills. The Strider 12” Classic balance bike is available in a range of 4 exciting colours, and priced at £66 it is a fantastic mid-range option for budding riders. The Strider 12 Sport balance bike includes all of the features of the classic model, but includes some additional extras to justify the extra £22 spend. The most significant of these is the inclusion of the extra-long seatpost, so this means that you can genuinely extend the saddle height up to 48cm. A padded seat is also included, as well as a race pad for some cool styling and additional protection. This means that the Strider 12 Sport balance bike is a much better option for slightly older children, and for those children more confident with their balance as some of the extra features would be wasted on 2-3 year olds. The Strider 12 Sport Balance bike is available in a choice of 5 different colours and is slightly more expensive than the classic version at £88. One of the selling points of a Strider balance bike is that once your child has mastered the art of balance, the bike becomes a toy and the grippy, off road tyres means that is ideal for the park, the woods and the BMX track. Some children have become experts with a whole range of tricks, and there is a whole programme of events, challenges and tournaments dedicated to Strider balance bikes. The Strider Classic and Sport both come equipped with a built in launch pad footrest, which gives the rider a place to put their feet while gliding as well as the ability to pump and perform jumps on the bike! Events include the Strider British Balance Bike Championships which provide children which the chance to show off their skills on some of Britain’s best BMX tracks. What a great breeding ground for future British sporting champions! If you are just starting out, then you can practise your skills at a Strider Adventure Zone which is a friendly environment where children can try out new tricks and improve their skills. The original Strider balance bike was built around the concept of being lightweight, and Strider have taken this to the next level with the Strider 12 Pro balance bike. This bike is made from extremely lightweight aluminium, which means that it weighs in at a very impressive 2.4kg (this compares to the 2.9kg of the Strider Classic and Sport). It also has a very different look in striking silver. The weight is kept down with the Strider exclusive white Ultralight Wheels which have a five spoke design with 10 supporting gussets, providing maximum support with this very lightweight material. 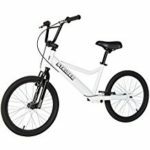 Other quality features of the Strider 12 Pro balance bike include a unique aluminium handlebar which is specifically designed for smaller hands, and a number plate that looks really cool to give the bike a very racing feel. This bike is also really easy to assemble with a quick clamp adjustable seat and handlebar height so no tools are required. It is priced at around £110.. The Classic, Sport and Pro bikes are all aimed at riders aged 2-5, as this is when most children will be learning to ride before they graduate to a ‘proper’ pedal bike. However, there are also bikes available for children aged 6 and above, as some children learn at a later age and these bikes are also suitable for children with special needs. Strider offer the Strider 16 Sport balance bike, which is suitable for children aged 6 – 11 and is a redesign of the previously featured Super Strider 16” bike. The most obvious difference between this bike and the previous models is that it is much larger. The seatpost is suitable for children with an inseam of between 52.1 – 67.3cm, and it is also able to support riders weighing up to 85kg. The bike itself weighs 8kg, so this is not a bike that is quite as easy to carry around! This bike looks great with wide handlebars, a fully padded seat and a front and rear v brakes, so it has plenty of features. It also includes cross terrain tyres and the fully integrated footrest, so it is suitable for older children who want to practise their tricks if they have outgrown their first Strider model. 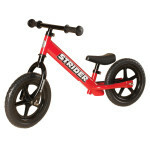 Although the Strider 16 Sport balance bike is quite expensive at £150, it is a sturdy and top quality bike and one of the leading models around for older children. 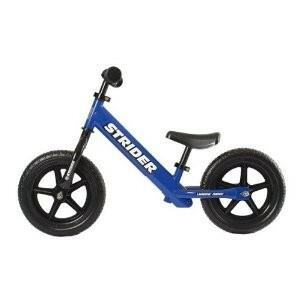 The final bike in the Strider balance bike range is the Strider 20 Sport balance bike. 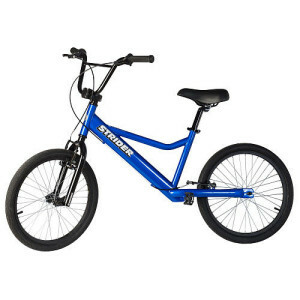 This bike is one of the few balance bikes available for teenagers and adults, with a very similar design to the Strider 16 Sport bike including the wide handlebars and integrated footrest. This bike is featured in more detail in our post on Adult balance bikes, and one of the very few models available for this age range. It has an adjustable handlebar for various rider heights, as well as removable footrests for striding or advanced riding. As with all balance bikes, riders should be well equipped with a helmet, pads and other safety gear – especially if you are going to be practising those tricks on your Strider!